Market research involves a lot more than just numbers and statistics. Let’s face it, there’s simply no value in just reading a pie chart to find out that 45% of the market is aware of your product. Researchers uncover the meaning behind the data. They take a closer look to find out why people make decisions, and interpret the underlying motives behind those decisions. That’s what’s valuable, and to figure that out involves a little psychology. In the spirit of fun, we collected some (unscientific) data at the Qualtrics X4 Summit about market researchers. And we’d love to hear what you think it means. Only 20% declared they were cat people, compared to nearly 66% who said they favored canine companions. Yes, you heard it right. Controversial? Perhaps. Decisive? Absolutely. Is this a crushing blow for the legions of kitty owners out there? Why Qualtrics X4 Summit attendees preferred dogs over cats quite so conclusively, we’ll likely never know. 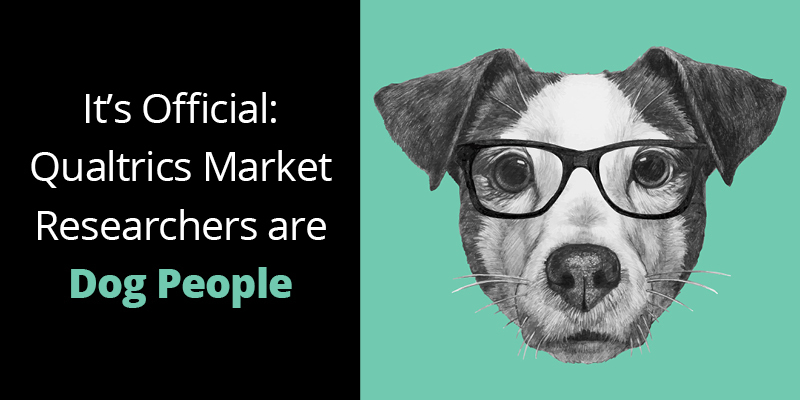 In the U.S. as a whole, there are more pet cats than pet dogs, so it seems like the market research community may be outliers. We fall on the side of thinking it’s hog-wash, and that there are dog and cat people of all personality types. What do you think? Rybbon is in the business of incentives management, so we had a $5 reward for everyone who took our survey, which allowed survey takers to experience our awesome platform first hand. Surprised? We were a little. As an event focused on breakthrough experiences, the Qualtrics X4 Summit agenda was jam packed with extraordinary activities. A Tony Hawk skate ramp exhibit, a street-style dance battle and an Imagine Dragons concert are not the norm at your run-of-the-mill tech conference. It was a once in a lifetime opportunity to hear from some of the biggest names of our day and industry leaders about how businesses can best deliver groundbreaking experiences to their customers and employees. Over the course of the summit, we gained a ton of insights and some incredibly valuable takeaways. Read more about our top takeaways here: Oprah and Obama Made Qualtrics X4 Summit 2019 Unforgettable — Here’s What We Learned.